The current buzz on the ecumenical front might be dominated by the establishment of a new Anglican province in North America... but worthy of more attention -- especially 'round these parts -- is the "astonishing, spirited" earthquake in Stateside and Canadian Orthodoxy that took place a couple weeks back in Pittsburgh. ...then, hours later, said juniormost prelate -- a 49 year-old monastic who converted from Anglicanism before his 20th birthday -- was elected as the church's new head. As they say, "No good deed goes unpunished." 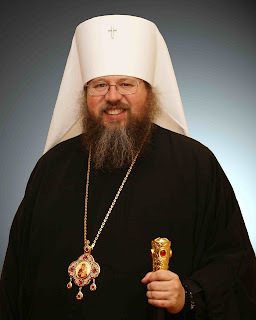 Born James Paffhausen in Chicago, the newly-elevated Metropolitan Jonah will be installed as the OCA's primate, archbishop of New York and Washington at a divine liturgy in the capital on 28 December. 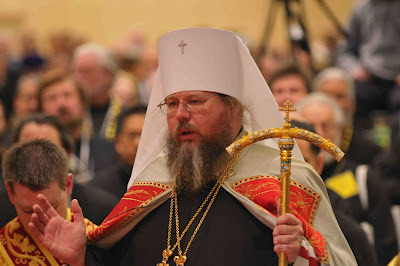 In English this means, “Many years to you, master.” Witty bishops in the Orthodox Church in America have started using this sentiment as the punch line in a joke about the impact the episcopate can have on their egos. Only 10 days earlier, the 49-year-old monk had been consecrated as assistant bishop of Dallas. Now, he was facing the clergy and lay leaders of a flock that was reeling after years of bitter scandal — including the disappearance of $4 million — that had forced the church’s last two leaders out of office. The new and, thus, unstained bishop volunteered to face the assembly and answer hard questions about reform. The bottom line, he said, was that investigators found a “fundamentally sick,” corrupt culture inside the national headquarters that was rooted in fear and intimidation. “Yes, we were betrayed. Yes, we were raped. It’s over. It’s over,” said Jonah. In fact, whenever church members seek healing, “we have to confront the anger and the bitterness and the hurts and the pain and the resentment that we have born within us as reactions against the people who have hurt us. Becoming a bishop turned his once-secluded life upside down, explained Jonah. Now it’s hard to even discuss his stunning election as primate on Nov. 12. “They talk about ‘His Beatitude’ and I wonder who that is,” he said. If nationwide change is going to happen, said Jonah, it will have to grow out of respect and cooperation at all levels of the church. Video of the election and audio of Jonah's speeches and other interventions at the 15th All-American Council are available on-demand... as well as his meditation for Advent.